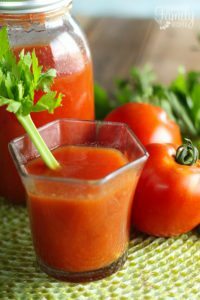 This Homemade Tomato Juice tastes similar to V8 but is SO much better! Delicious served as a beverage but can also be used in recipes or as a soup base! water approx. 1/4 c. to 1 c.
Wash, core and remove blemishes from tomatoes. In a large stock pot, add tomatoes and very little water (at most 1 cup). Put through colander to remove seeds and skin (see above notes for tips). Return juice to the stock pot and bring to a boil again, adding salt, onion salt, and celery salt according to how many quarts of juice you have yielded. If canning, pour into sterilized jars leaving about 1/2" air space at the top.